The day after making gluten free hotdogs with Dietary Specials White Baguettes, I decided to resurrect subway/po'boy Friday. 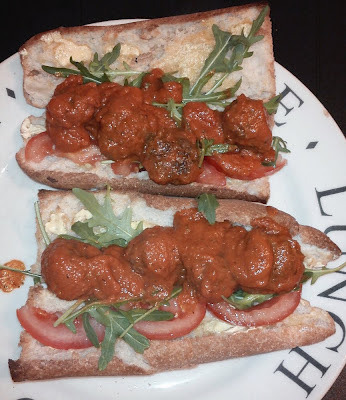 This started because me and my husband always fancy something a bit naughty to eat on a Friday evening and we came up with the idea of re-creating the Po'Boys we had in New Orleans. Then things got slightly out of hand as the fillings became more and more extreme! I used my remaining baguette and the following ingredients to create a really delicious meal. Sprinkle salt over your mince and mix in thoroughly. Then make ball shapes from the mice. Fry in a little olive oil until brown and cooked through. In a saucepan, fry half an onion with garlic (I used 4 cloves but it was slightly too much for me). Add a couple of bay leaves and 1/4 teaspoon of chili powder. Cook the sauce for around 20 minutes so that the sauce reduces down and the flavours get to work. Add the blended sauce back to the saucepan, then add the cooked meatballs and heat through. Serve the baguette with salad and the meatballs and sauce. I could seriously eat this every day!